Three players were accused of stealing sunglasses from a Louis Vuitton store while they were in China for a game. 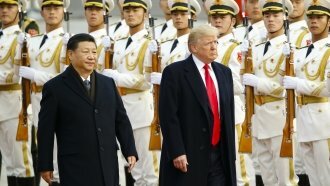 President Donald Trump has asked Chinese President Xi Jinping to help resolve the case of three UCLA basketball players arrested in China on charges of shoplifting, according to a report from The Washington Post. If all of that sounds a little too "2017" for you, let us explain. The three players are LiAngelo Ball, Cody Riley and Jalen Hill. They were in China with their teammates to play a game against Georgia Tech in Shanghai on Saturday. But a few days before the game, the players were accused of stealing sunglasses from a Louis Vuitton store near their hotel. If you're a basketball fan, you probably know who LiAngelo Ball is. He's the brother of Lakers point guard Lonzo Ball. He's also the son of LaVar Ball, who owns a basketball shoe company and is rather ... outspoken about himself and his sons. "One-on-one, I'm undefeated, never lost," LaVar Ball told ESPN's Stephen A. Smith on a March episode of "First Take." He was arguing that he could beat basketball legend Michael Jordan one-on-one. Anyway, LiAngelo Ball, Riley and Hill were released on bail but didn't play against Georgia Tech, and right now they're still in China. It's not clear when they'll return to the U.S., which is where President Trump comes in. The Post says Trump mentioned the players to Xi while he was visiting Beijing and that Xi told him he'd do his best to get the case resolved quickly. A source also told the Post it looks like the players' charges are being reduced. That's important because the stakes are pretty high here. It's tough to tell exactly what punishments these players could be facing, but under Chinese law, a prison sentence would not be out of the question for this sort of crime. All this means a possible assist from Trump could go a long way in helping get the players home sooner. For now, though, ESPN says they'll have to stay at their hotel for another week or two.